Parents with children. Uncles with nieces. Aunts with nephews. And of then there are the in-laws. he famous in-laws. Of course, all this family friction makes for great comedy... as the Focker ilm series has shown. T he Focker ilms revolvearound the struggle between Gaylord “Greg” Focker (Ben Stiller) and his fatherin-law, Jack Byrnes (Robert De Niro). We irst met Greg in the 2000 movie Meet The Parents. In that ilm, Greg and Pamela (Pam) are engaged, but before the wedding, Greg has to met her parents: Jack and Dina Byrnes. The sequel to the ilm was Meet the Fockers, in which Pam’s parents meet Greg’s parents (played by Dustin Hofman and Barbra Streisand). In the latest ilm, Little Fockers, Greg and Pam have ive-year-old twin children. And the in-laws are getting together for Christmas. Will Greg be able to cope? 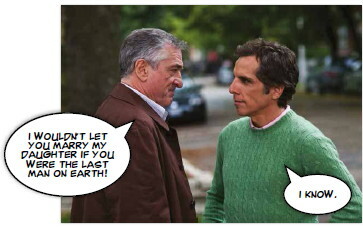 The Final Film in the series is Little Fockers. Robert De Niro plays Jack Byrnes, Ben Stiller is Greg, Barbra Streisand is back as Roz (Greg’s mum), Dustin Hofman returns as Greg’s father Bernie, and Owen Wilson makes an appearance as Pam’s lovesick ex-Fiancé. But there are lots of new characters too, such as the twins’ headmistress (played by Laura Dern). Great news! 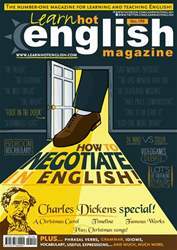 The latest issue of Hot English (199) is out now! Learn over 1,000 useful words and expressions and improve your listening skills with Learn Hot English! This month: Learn how to negotiate in English – perfect for both business and your day-to-day life. We’ll teach you lots of useful tricks... in English! Plus, 8 useful words and expressions for talking about the bedroom, 10 useful words for the street, idioms, phrasal verbs... plus: • Business – IKEA • Jokes – jokes in English. • Travel – the Lake District • Functional language – paraphrasing • Grammar – the adverb too • Accents – the German English accent. • Debate – videogames • Education – weird courses • Language – how to learn English grammar • Literature – Charles Dickens • Cinema – The Fockers • Work – Jobs that disappeared... then came back! • Family – in-laws • The environment – biodiversity • Music – Christmas songs AND LOTS, LOTS MORE! By reading and listening to all this great content, you'll improve your English reading and listening skills and learn up to 1,000 useful words or expressions. Plus, you'll get a better job and pass English-language exams more easily. Guaranteed! NEGOTIATION TACTICS TO HELP YOU GET WHAT YOU WANT! Have you ever entered a competition?